One of the first things we saw in Tokyo was this scene in Yoyogi Park on our way to the Sunday flea market. There were way more hula hoops than people and I couldn’t tell if these women wanted attention or not. Unlike some other Yoyogi park performers, they were pretty far removed from the path (we had to zoom way in for this pic). Right next to the flea market we saw some bboys practicing and they were obviously happy for the attention. Interestingly, they never passed around a hat for money like I think most street performers do in America. They were there for fun. That’s what wikipedia says anyway. 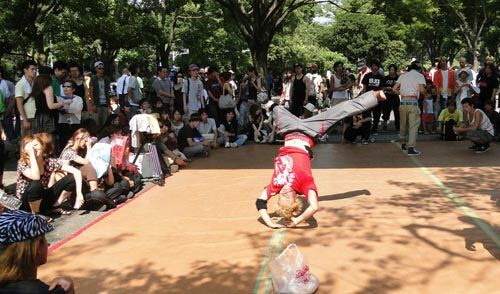 I don’t know who says breakdancing now – everyone in Korea at least talks about bboys. I’ve seen bgirls in Korea as well – not sure if they get called bgirls, or what though. What can be very impressive is the strength these guys display when they do 1 arm handstands and the like.